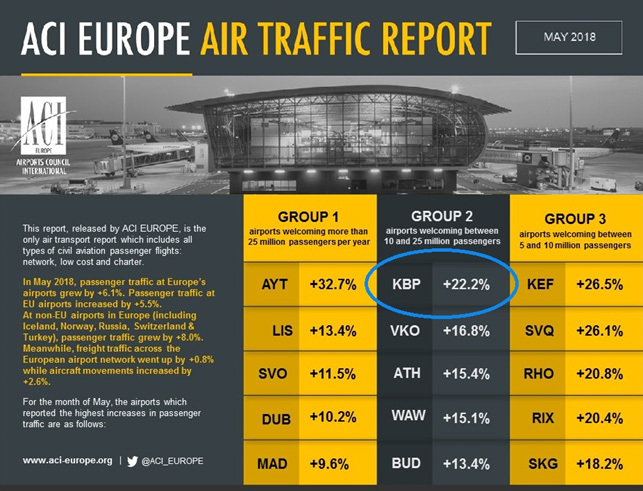 According to the Airport Council International (ACI Europe) assessment for May 2018, Boryspil Airport continued its dynamic increase of passenger traffic and reached a growth rate leading position within the category of large airports. Servicing from 10 to 25 million passengers and ensuring a 22.2% increase in passenger traffic, Boryspil Airport had managed to reach the top of the rating. Other airports within the group have also shown a dynamic increase in passenger flow: Vnukovo (+ 16.8%), Athens (+ 15.4%), Warsaw (+ 15.1%) and Budapest (+ 13.4%). In May, during the UEFA Champions League finals in Kyiv, the airport had reached its personal record, servicing 60,300 passengers (regular and additional charter flights) during the peak period (from 15:00 on May 26th to 15:00 on May 27th), which became an absolute record in comparison to other periods of Boryspil Airport’s activity.